Nuclear fusion is the holy grail of clean energy. It's the energy the sun runs on. It doesn't generate greenhouse gases or nuclear waste. It's also been pretty much out of reach for mere mortals like us to create. But Tuesday, physicists at Lawrence Livermore National Lab's National Ignition Facility said they've taken a significant step. 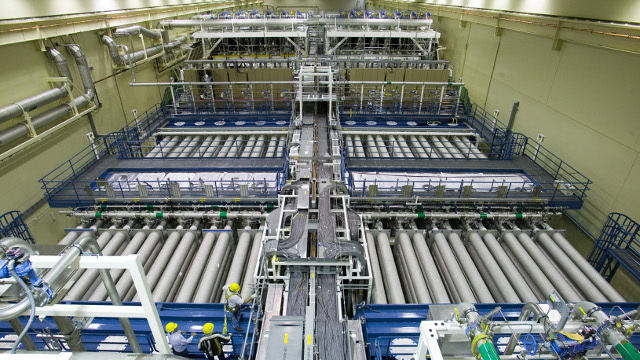 The laser is known as the National Ignition Facility, or NIF. Constructed at a cost of more than $3 billion, it consists of 192 beams that take up the length of three football fields. For a brief moment, the beams can focus 500 trillion watts of power — more power than is being used in that same time across the entire United States — onto a target about the width of a No. 2 pencil. The goal is fusion: a process where hydrogen atoms are squeezed together to make helium atoms. The milestone that scientists published today in the journal, Nature, is this: more energy is coming out of that pellet of fuel than they're putting in. But it's not more energy than is in all those lasers overall. Only about one percent of all the lasers' energy is actually reaching the fuel. "You can think about this as a proof of principle," Livermore Lab physicist Denise Hinkel told KQED. "Once we've performed the proof of principle it opens up the horizon and opportunities for different creative ways to use it." The reactions... produced nearly 10 times as much energy as the previous record for laser fusion research. But they still fall well short of recouping the energy supplied by the world’s most powerful laser. After scientists completed the experiment last fall, it generated some breathless headlines. This article from Science gives some perspective. In the past, NIF has come under criticism for falling short of expectations. It cost $5 billion (that's construction plus operating costs), and missed its target of achieving ignition by October, 2012. Want more NIF? Here's a video KQED produced about it before it opened.